Sitting and sipping refreshing drinks on Caffe Wunderbar’s alfresco terrace is like being perched on the edge of the world. Sky and sea seem to fuse in a wall of bright blue. Such is the hilltop town of Taormina’s precarious setting on the side of Sicily’s Mt Tauro that lots of places offer similarly spectacular views. The cafe’s red-vested waiters dart between its outdoor tables like fireflies. Patrons smoke. This is Italy. So does the mountain not far in the distance. This is Etna, Europe’s highest and liveliest volcano, its slopes a pastiche of stark, dark lava and bright, white snow. “Un campari ed un sode ed uno birra – Peroni, per favore.” The drinks take a while to arrive. Who cares – there’s that elevated vista to consume. Looking sou-west towards Etna the panorama sweeps down its smoking slope to the indigo sea at nearby Naxos, one of the earliest Greek cities in Sicily, first settled in the fourth century BC. Arcs of sandy beaches speckle the coast north and south while clearly visible out to sea is the ‘big toe’ of mainland Italy. This wonderful Caffe ‘on the edge of the world’ occupies a prime corner along the pedestrian-only Corso Umberto 1 at Piazza IX Aprile. It’s ideal for the twilight passeggiata; that culturally enshrined Italian rite of promenading and perusing. Truman Capote (played in the multi-award winning film by Philip Seymour Hoffman) enjoyed many a martini at Caffe Wunderbar. “It’s a beautiful piazza,” he wrote of the bar’s location, “centering around a promontory with a view of Etna and the sea. Toy Sardinian donkeys attached to delicately carved carts, go prancing past, their bells jingling, their carts filled with bananas and oranges”. When playwright Tennessee Williams came to stay, Wunderbar was where the two often went drinking. What stories those tables could tell! My arrival in Taormina was late in the evening after several frantic weeks on the Italian mainland. Perhaps it was the wine-dark night and my depleted energy reserves that conspired to hide the full extent of the steep uphill taxi trip from the train station at sea level to my hotel. Midnight check in at the Pensione Svizzera (reservation completed online months earlier) went as smooth as the cognac nightcap I consumed. Sleep was never so sweet. 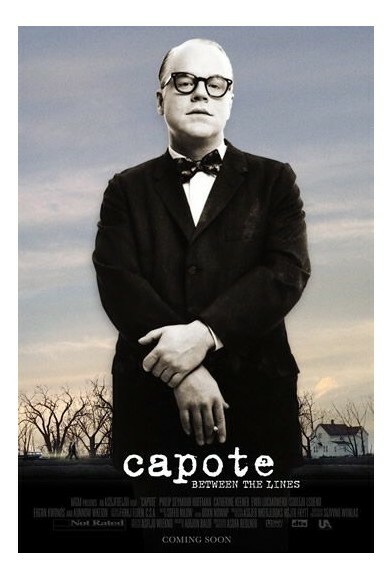 On sliding the curtains back next morning however, a line from Capote quickly came to mind: “it was like living in a ship trembling on the peak of a tidal wave”. The sea, far below, was all I could see. While he could easily have been describing the view from my room, Truman was actually referring to the 17th century villa, Fontana Vecchia (old fountain), he and his lover, Jack Dunphy, rented during their 18-month stay in Taormina. The isolated rustic abode, set amid almond and orange groves, was a 15-minute walk from town (and my pensione) along a winding rocky road. It was April 1950, with spring in full swing, when the American men took up residence in the villa. “There is a momentous feeling each time one … steps onto the terrace, a feeling of being suspended, like the white reeling doves, between the mountains and above the sea,” wrote Capote. Coincidentally, the English writer, D.H. Lawrence and his wife Frieda occupied the very same house some 30 years earlier. What stories those walls could tell! Lawrence finalised The Lost Girl during his two-year stint there. The privately owned villa is not as isolated today as it was in Capote or Lawrence’s day. To visit, take the winding via Cappuccini as it leaves the eastern entrance to the old town. This road becomes via Fontana Vecchia, which on more recent maps, is listed by its official name, via David Herbert Lawrence. Capote has yet to trouble the cartographer. It’s the oldest house on the street. And looks it, in a rustic-chic kind of way. Keep an eye out for its distinguished but fading pinkish exterior, Spanish-tiled roof (without eaves) and dizzyingly steep outlook. “David Herbert Lawrence lived here 1920-1922,” proclaims a plaque on the wall. But our Fontana Vecchia villa residents were not the first writers of renown to visit Taormina. The town’s literary pedigree probably began with Goethe. The German poet and dramatist waxed lyrical of this “patch of paradise” in his 1787 Italian Journey. And the writers have been arriving ever since: Dumas, de Maupassant, Dahl, Steinbeck and Wilde. So too musicians, Wagner and Brahms. So too artists, Klee and Klimt. “The town, not large, is contained between two gates. Near the first of these, the Porto Messina” writes Capote, “there is a small, tree-shaded square with a fountain and a stone wall along which village idlers are arranged like birds on a telephone wire.” In some ways, little has changed in the ensuing 50 or so years. Perhaps that’s part of the allure? Sure, there are plenty of quaint and majestic towns teetering on cliffs all around the Mediterranean. You only have to glance across the Straits of Messina to the Amalfi Coast for the nearest example. 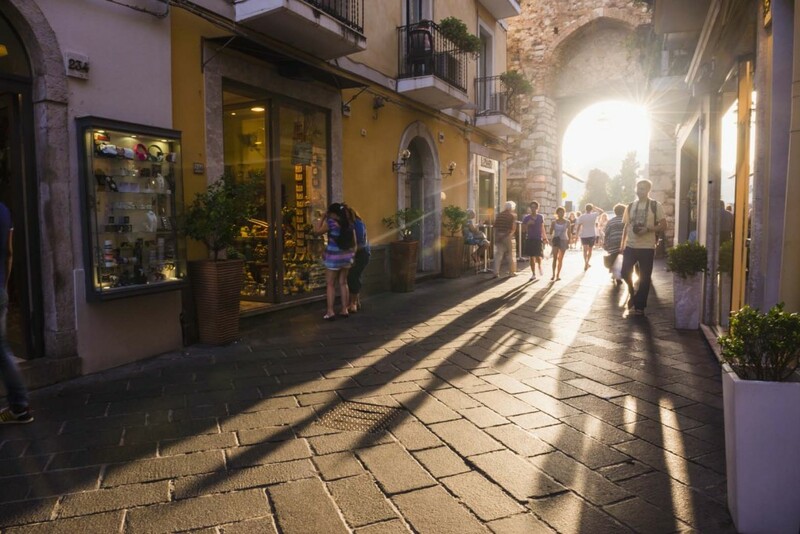 But what sets Taormina apart are arguably its unique natural geography and extraordinary architectural, cultural and culinary legacy left by centuries of various invaders. 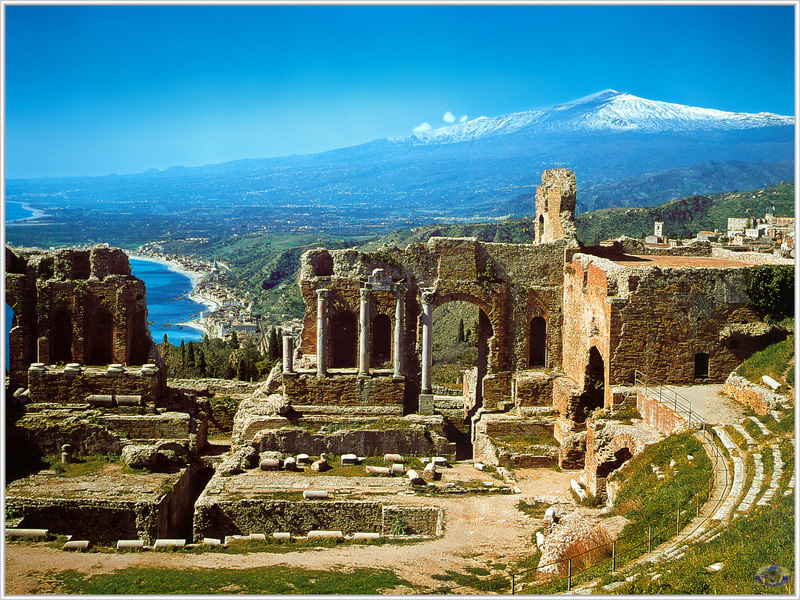 Strategically located on major maritime trade and warfaring routes, Sicily, and in particular, Taormina, have been occupied by just about every civilisation in the ancient and modern worlds. The Greeks began the procession and in turn the Romans, Byzantines (who made Taormina their capital in the 9th century), Saracens, Normans and Spaniards, even the French, have all left their mark. And without question the greatest mark, the jewel in Taormina’s aesthetic crown, is the dramatically situated Teatro Greco. Begun by the Greeks but finished by the Romans, the 5,500-seat arena adorns a naturally curving cliff-top plateau with Mt Etna’s fuming plume and the glistening sea forming an imposing backdrop. Nothing prepares you for such jaw-dropping grandeur. “Sitting at the spot where formerly sat the uppermost spectators, you confess at once that never did an audience, in any theatre, have before it such a spectacle as you there behold,” observed Goethe. Today, the Taormina Film (mid June) and Arte (July/August) Festivals stage many outdoor events in this unrivalled arena. Once done with the theatre, just wander. Many meandering streets – while they can be steep – are little more than perfectly preserved cobblestone paths; hence no cars. If the way becomes too tiring or the day too stifling, shade, a shop, a beverage or a pastry and a revitalising view are never far away. Discover Dolce & Gabbana alongside dolce and cassata. The elegant Parco Duchi di Cesaro gardens, just below the Greek theatre near via Roma, offer a stunning and scented interlude. This wonderfully spacious public space – its rows of hedges have not a single leaf out of place – was bequeathed to Taormina by English woman, Florence Trevelyan, at the end of the 19th century. Further along via Roma is the San Domenico Palace, originally a 15th century monastery but since its 19th century hotel conversion, is now redefining the meaning of five-star luxury. European aristocracy, wannabe glitterati and Hollywood royalty clamber to fill its guest register. Depending on your mood, the mood of the fuming mountain or that of the weather, consider a visit to Mt Etna. Self-guided walking trails are available to a certain elevation, but to better experience what the Romans called the realm of Vulcan, God of Fire, organised trekking and 4WD tours – easily done in a day – could be a more rewarding option. Or if swimming is your thing, numerous beaches dot the coast. A steep cable car connects hilltop Taormina to Mazzaro Bay below in a matter of minutes. But it was a long and arduous walk down the mountain from Fontana Vecchia to the water for Capote and company. They ventured there often in the warmer months, especially to the exquisite Isola Bella, “a guarded cove with water clear as barrel rain.” These days, expect to pay for access and a sun lounge in hot months if you’re not staying at one of the resorts right on the beach. It’s a small price to pay because as Capote warned, August can be warm, the sun enlarges: “Figs split, plums swelled, the almonds hardened … you remember that Africa is only eighty miles away”. Sooner or later, the prospect of food looms. It’s usually simple but sublime. There’s plenty of seafood and regional specialties. They make tremendous local wine. And forget about counting calories; Sicilian pastries, like the highly prized cannoli, are flown to the Italian mainland, such is their reputation. Back on a Taormina side street in a regular restaurant, a simple pasta con sarde epitomises local cuisine. In this particularly version (sans anchovies), salty sardine fillets are mashed and sautéed with olive oil, onion, pine nuts, wild fennel, fresh sweet basil, along with the ubiquitous seasonings into a chunky paste, and then tossed with bucatini pasta (preferably cooked in the same water used to boil the fennel). My time in Sicily was full of culinary highlights, none more so than this classic dish. But as for cooking, Capote couldn’t. Nor could his partner. Nor the female cook they employed for the task. But the American men survived, “as long as she [kept] to simple Sicilian dishes, really simple and really Sicilian”. Capote completed most of the Grass Harp novella while ensconced in Taormina. Upon publication it soon became his most celebrated work to that point, arguably cementing his international reputation as a distinguished author. Breakfast at Tiffany’s and In Cold Blood came later. Well, the running water, foreign press and good martinis can still be found; so too can the Fontana Vecchia villa. But now the tourists are in abundance. All year round. Who can blame us? We’re merely the latest in a long line of foreign and local visitors – dating back to the ancient Greeks – who came, saw and while some conquered, all were thoroughly beguiled by Taormina’s imposing physicality and its intoxicating beauty. Goethe got it right; “A patch of paradise,” indeed.